For a gala wine dinner, upon learning Dr. Dan was announcing daughter Hill's engagement, we pulled from the cellar 1987 birth year wines to celebrate the occasion. 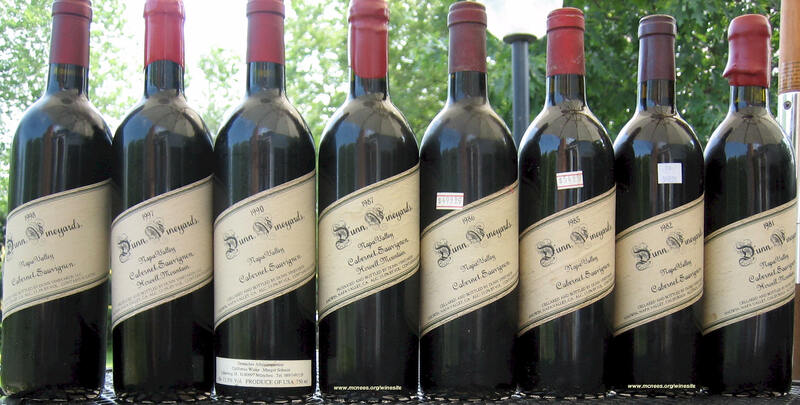 The feature wines were 1987 vintage Dunn Vineyards Howell Mountain and Dunn Napa Valley Cabernet Sauvignons. This lead to a flight of Howell Mountain Cabernets as the wine theme for our dinner, which is one of absolute our favorite Napa appellation/wines. 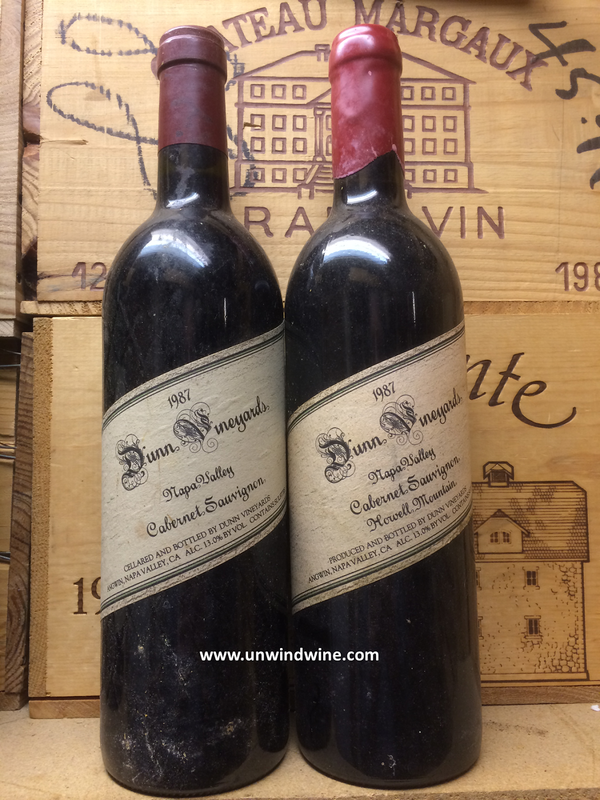 My records show that we hold a vertical collection of sixteen vintages of Randy Dunn's classic Howell Mountain Cabernet and eighteen of the Napa Valley, going back to the 1980 vintage. This is a suitable collectable wine as it is known for its legendary longevity, which was evidenced by tonight's tasting. Their age worthiness begs for an occasion such as tonight to open an aged vintage selection. Meeting Randy and Kristina Dunn at the winery up on Howell Mountain was a highlight of our Napa Valley Howell Mountain Wine Experience in 2008. To round out the Howell Mountain flight, we pulled O'Shaughnessy Howell Mountain Cab and Viader Napa Valley Red Blend 2000's, and Bill brought along a Camiana Howell Mountain Cab 2007. 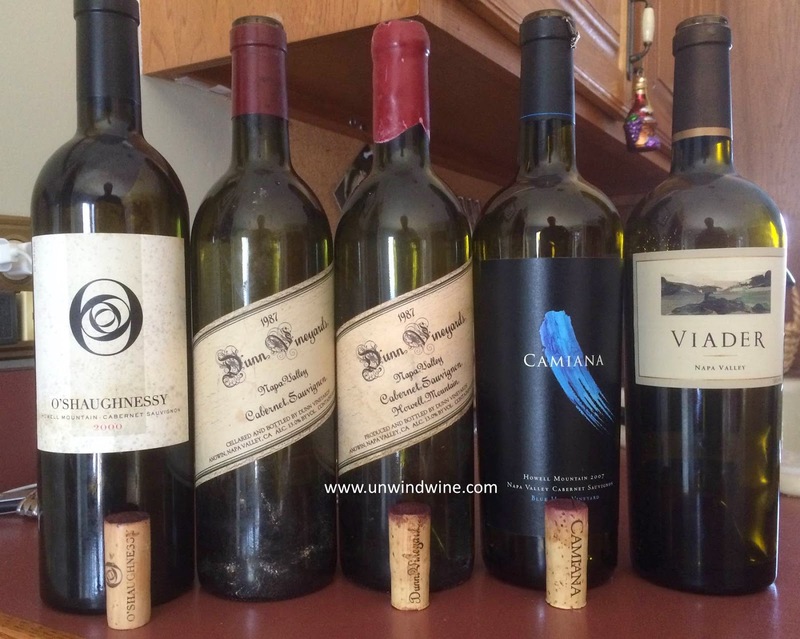 If we had more participants, the next likely wine in the flight would have been Clark-Claudon as we have a vertical collection spanning almost two decades of that notable Howell Mountain label as well, or a Palmaz Napa Valley Cab which is also crafted by Randy Dunn. Adding to the Dunn Howell tasting experience was the fact that Bill just tasted the 2001 vintage at Morton's Grill in NY last weekend. The selected course for the wine dinner was beef tenderloin, roasted gold potatoes, haricots verts, dinner salad and desserts. 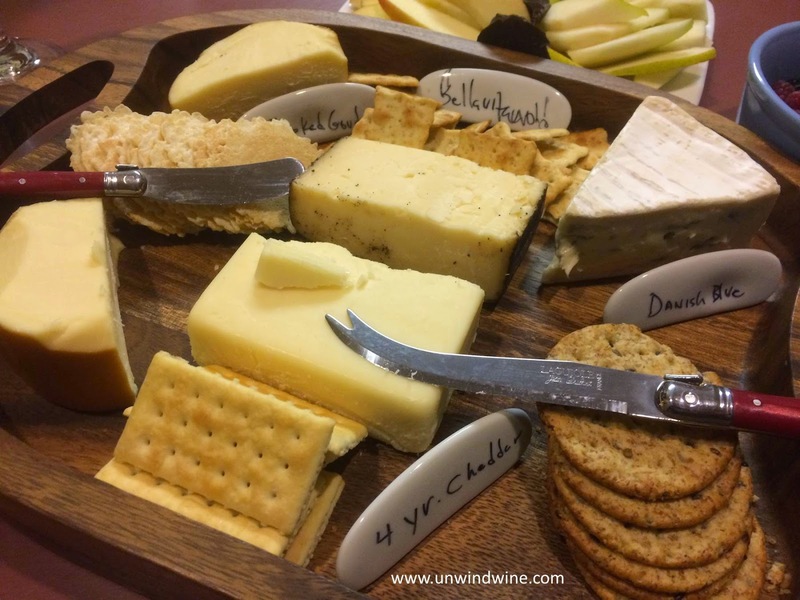 Prior to dinner we had a selection of artisan cheeses with fresh fruits - apple and pear slices and mixed berries. The cheese flight consisted of Bellavitano, Danish Blue, Smoked Gouda, and 4 year old aged white Cheddar (shown left). 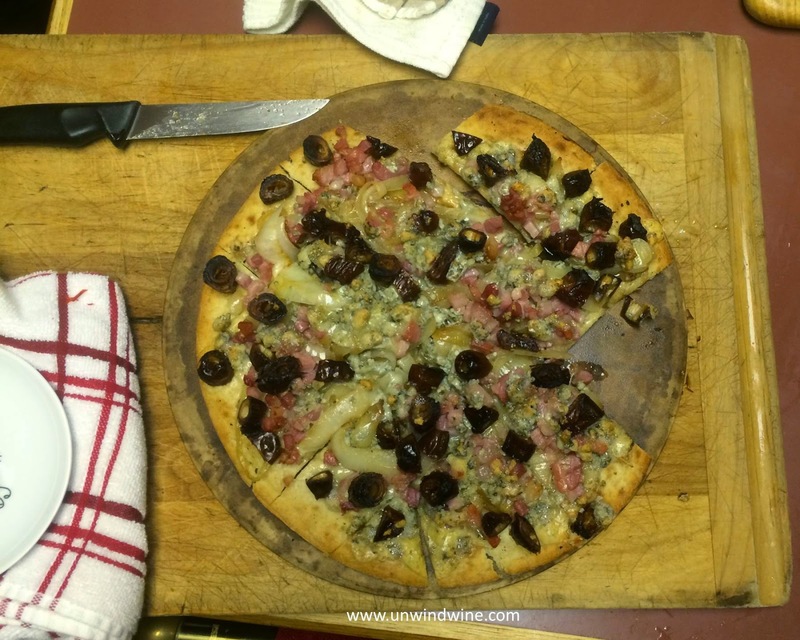 Dan prepared a scampi dish and a flatbread with dates, onions, cioppino and blue cheese (see below). 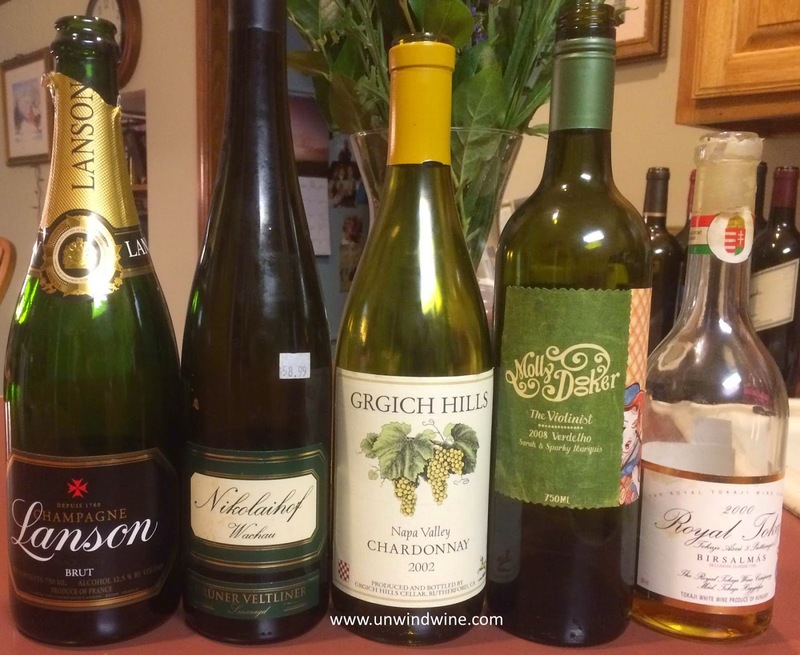 The scampi and flatbread starter course, as well as the cheese flight were accompanied by a white wine flight of Lanson Brut Champagne NV, Grgich Hills Napa Valley Chardonnay 2002, Nikolaihof Wachau Grüner Veltliner Smaragd Im Weingebirge 2006, and a Mollydooker 'Violinist' Verdelho 2008. We also had open a Royal Tokaji Birsalmas 5 Petunyos. 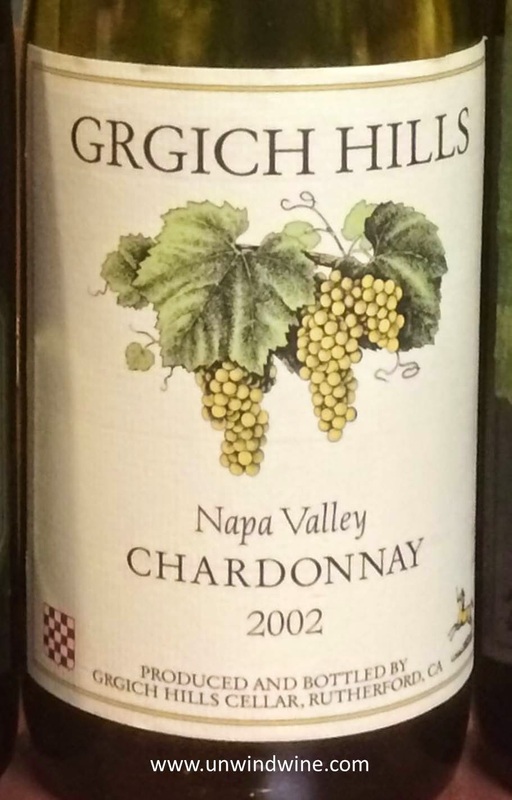 Dan brought a Grgich Hills Napa Valley Chardonnay 2012. Ironically, I already had chilled and open the 2002 which we opted for as its time to drink being near the end of its drinking window. 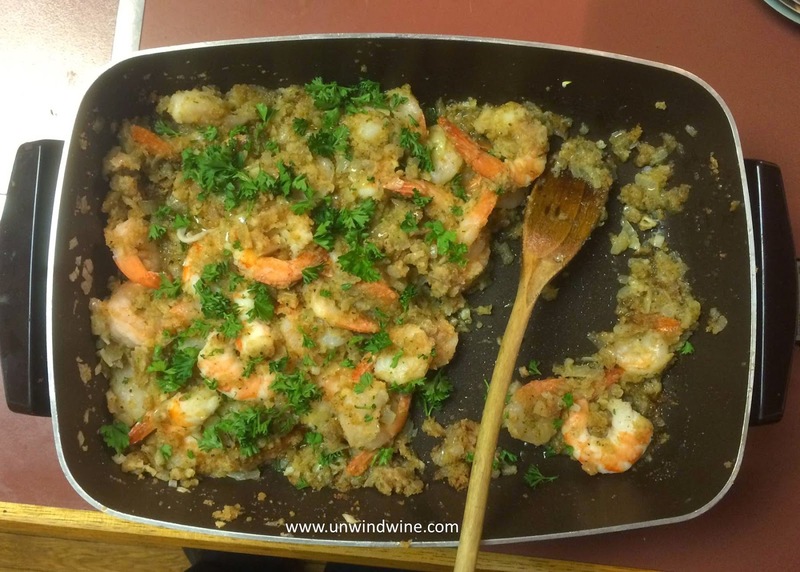 We normally don't get so invested in a white wine flight but Dan's scampi and flatbreads that he brought and prepared on site warranted more attention to the pairing. The Verdelho and the Royal Tokaji were already open in the cooler, left over from an earlier tasting, and holding sufficiently to be part of the flight. 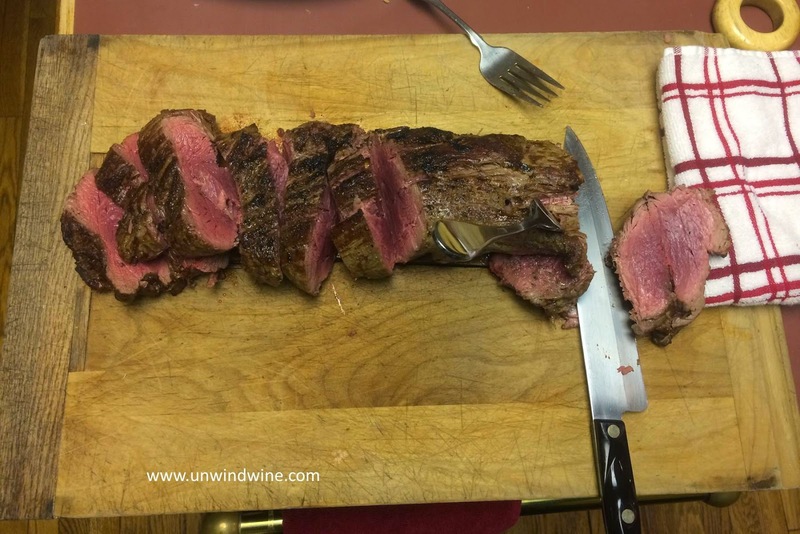 I opened and decanted this about four hours before dinner. The cork crumbled completely requiring a further fining through a coffee filter. Having never opened a 28 year old Dunn Howell before, with the obliterated cork I was prepared for anything, but all my hopes and expectations were fulfilled as there was no sign of diminution from age whatsoever. Resembled a Left Bank Bordeaux more than a Napa Cab, dark garnet colored, full bodied, the Dunn exhibited aromas of leather, blackberry, black currants and floral tones. Complex but nicely balanced, the berry fruits were accented by a layer of leather and floral with tones of dried tobacco leaf and hints of creosote and earth on the firm but nicely integrated silky smooth tannin finish. I opened and decanted this about four hours before dinner, but unlike the Howell, the cork was perfect, as if it were a two year old! Like the Howell, this too showed no sign of aging. Very Bordeaux like with dark inky garnet/purple colored, medium to full bodied, complex and balanced black berry fruits with tones of lead pencil, tea, tobacco and hints of cedar and leather with acidity turning to modest tannins on the moderate finish. Tonight, this bottle was more vibrant and expressive than the previous one, lacking that 'flabbiness' and having more depth and concentration than previously. This was my second favorite wine of the evening behind the Dunn Howell Mtn Cab. 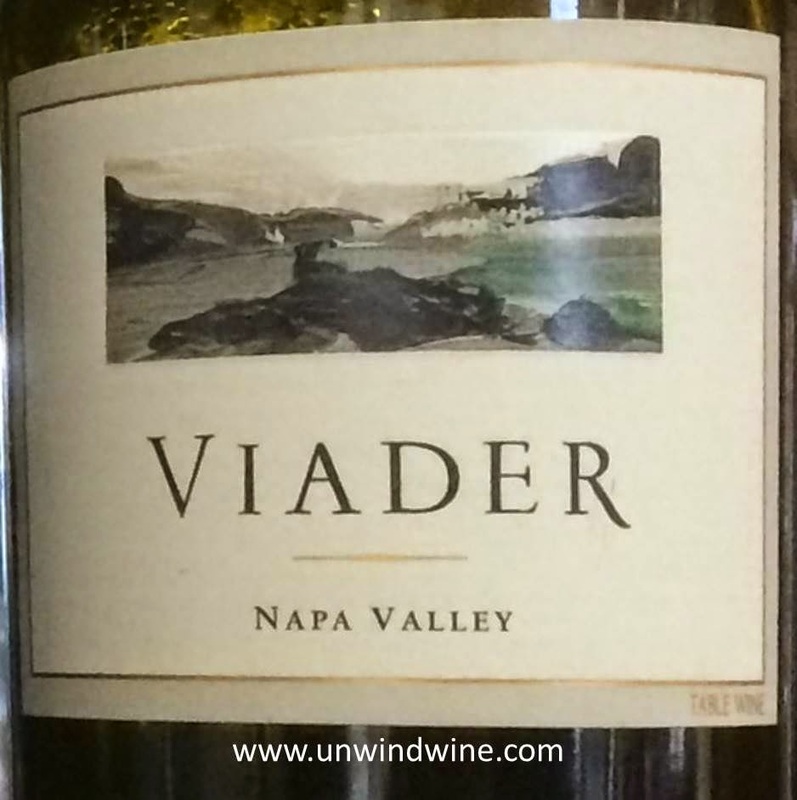 We met winemaker and principle Delia Viader and tasted this wine on a snowy early winter evening at a Viader tasting at the Chicago Lakeview Binny's. We then visited the winery during our 2008 Napa Valley Howell Mountain Wine Experience. We hold several vintages of this wine dating back to the nineties and tonight's tasting experience puts an exclamation point on the word 'hold'. Dark garnet colored, medium to full bodied, this resembled a top tier Bordeaux with its complexity, balance, integrated flavors and tasting profile, but was tight and a bit closed, begging for much more time to settle and open to reveal its true character. Dark berry and black cherry fruits were muted turning to leather, tea, hints of graphite and tobacco box. As we learned with many of our topflight Bordeaux, that we drank them too early, give it several more years. This is a blend of 63% Cabernet Sauvignon and 37% Cabernet Franc. Bill and Beth's son Matt discovered this wine and arranged for each of us to pick up a mini-vertical - 2004-2007 of this Howell Mountain Cab, which we have in the cellar. Ironically, we also tasted this wine two years ago this week when I wrote, 'The wine is full bodied and dark inky purple color, the nose is perfumed with violets, cedar box and dusty earth; The 2007 Cabernet Sauvignon flavors are complex, tight and dry, with big firm tannins masking the intense concentrated black berry and black cherry fruit accented with tobacco, hints of cassis and sweet oak. 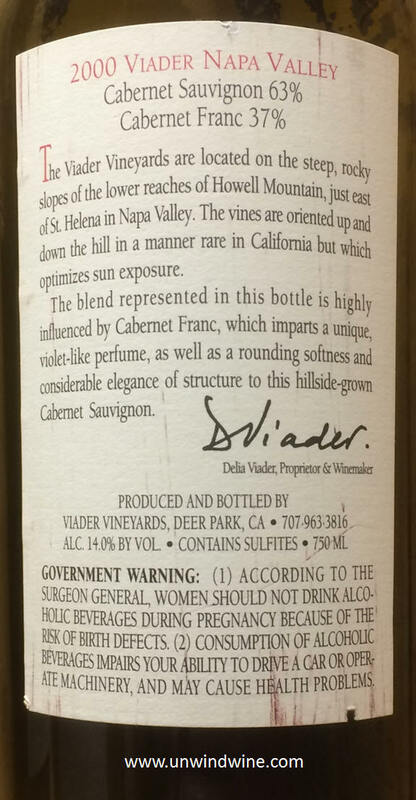 This wine is great now but should be laid down for five to 10 years.' Tonight, the fruit seemed more expressive and open, but coming across boldly, lacking finesse, balance or polish, coming across as youthful and, as written before, needing time to settle and harmonize. Light straw colored, medium light bodied. Bright tangy citrus aromas, clean and crisp bright expressive citrus on open that turns to complex layers of white fruits - melon, pear, lychee fruit and stone, finishing with tangy mineral citrus on the palate cleansing finish. This was the best match of the white flight with the scampi dish. Butter colored, medium bodied, complex and intriguing, this wine from this uncommon varietal is an interesting cross between the body of a full complex Chardonnay and the crispness of a Sauvignon Blanc - full essence of pear predominates with subtle melon and tropical fruits on a firm mineral finish. This was a surprise bottle I found in the Chardonnay rack in the cellar but it wasn't in our cellar inventory so I pulled it to drink as its was one of the oldest and time to drink since its likely approaching the last chapter of its drinking window. Gold colored, medium bodied, this packs complex full pear, green apple, mineral and a layer of buttery oak and bright acidity on a round finish.